Three of New York's premiere wine growing regions have joined forces to give wine lovers a chance to sample "great grape" they might normally miss. 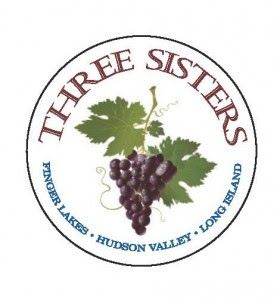 The Three Sisters Project is a mutual sampling program conceived by Carlo DeVito and David Jackson of the Hudson-Chatham Winery. This program not only highlights two of our favorite Finger Lakes wineries, but is a model that could be played with for use in other wine growing regions. Aside from that -- it's fun! The "sisters" refers to three wine regions -- the Hudson Valley, Long Island and the Finger Lakes. Two wineries in each region will sample and sell wines from the other regions along with their own products. The event is kicks off on Saturday, April 3, and runs through May 2. Hudson Valley: Hudson-Chatham and Benmarl. Long Island: Lieb Cellars and Macari Vineyards. Finger Lakes: Anthony Road Wine Co. and Fox Run. These three regions all share something in common – water. The three great wine growing regions of the program are all near a body of water. The Finger Lakes region is near the great clear water lakes that were gouged into the state’s land mass by the glaciers dating back to the Ice Age. Much of the North Fork of Long Island faces the Atlantic Ocean, while the North Shore is buffeted by Long Island Sound and the New England states which are just across that body of water. And the Hudson Valley follows the great and mighty Hudson River, first explored by Henry Hudson and his men more than 400 years ago, that stretches from north of the state capital in Albany, all the way down past Manhattan into New York Harbor. These three bodies of water create very specific micro-climates that help form some of the best grape-growing and winemaking regions on the east coast. Set among the rolling hills of the Hudson Valley and the Finger Lakes, and the slow, sloping land of the North Fork of Long Isalnd, these vineyards and wineries are among the best wineries in the state, and are dedicated to making quality wine. Wines from these regions have been celebrated in major press all across the country, including The Wine Spectator, The Wine Enthusiast, The New York Times, The Wall Street Journal, and many, many more. And they have won recognition of critics and peers alike from judges in compeitions from the east to the west coast, as well as internationally. HUDSON VALLEY: Benmarl Winery -- wines from Anthony Road and Macari Vineyards; Hudson-Chatham Winery -- wines from Fox Run and Lieb Cellars. FINGER LAKES: Anthony Road -- wines from Benmarl Winery and Lieb Cellars; Fox Run Vineyards -- wines from Hudson-Chatham Winery and Macari Vineyards. NORTH FORK OF LONG ISLAND: Lieb Family Cellars -- wines from Anthony Road and Hudson-Chatham Winery; Macari Vineyards -- wines from Benmarl WInery and Fox Run Vineyards. The goals of The Three Sisters Project are to help increase overall consumer awareness of the great local and quality wines being made in New York State, and to give wine buyers a chance to sample some of the great local wines from around the state.